It is very important to taste your mixture before making sorbet. The same fruits can have extremely different flavors depending on how ripe they are. If the fruits are very ripe, it is important to add lemon or lime juice to acidify the mixture a bit. I recently also learned a very good tip for sorbet- adding a small amount of liquor to the mixture will keep it from freezing too much and forming ice chunks. It will keep your sorbet nice and smooth. I am very happy with this recipe because I made it using only fruit and light agave nectar- no real sugar! You can use regular granulated sugar or agave nectar, whichever suits your tastes, but both work equally well. Puree the fruit in a blender until smooth, add up to ¼ cup water if needed to thin. Add the vodka to the mixture and taste for acidity, add lime juice if necessary. Stir in the sugar (or agave nectar) until dissolved, starting with ½ cup and adding more as needed (starting with ⅓ cup if using agave). Freeze in an ice cream maker until thickened (about 20-30 minutes). Transfer to the freezer and let firm up before serving. Join the Sweets For A Saturday link up party for more sweet ideas! Kiwi and raspberry sounds like a wonderfully refreshing combination – they’re both so tart and zingy! I bet it would be fun to play around with flavoured vodka for a little extra dimension of flavour… vanilla vodka sounds like it would be pretty yummy. Great tip on the alcohol, I always wind up with really hard sorbet! I remember getting crazy snowstorms so late in the season when I was living in CO. I think we had to wait until July to climb the 14ers! Thanks for the alcohol tip…that’s great to know! So pretty! 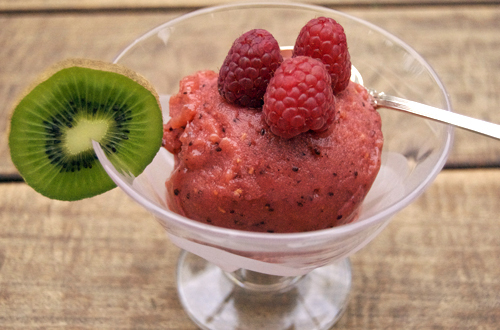 Great to put Kiwi and Raspberry together – wonderful idea! I just made ice cream today – I am going to have to try sorbet next! We’ve had a strange summer here in Seattle too- but the sun seems to be out today and I am so thinking about making this sorbet right now!!! Congrats on Top9 – great to find you! 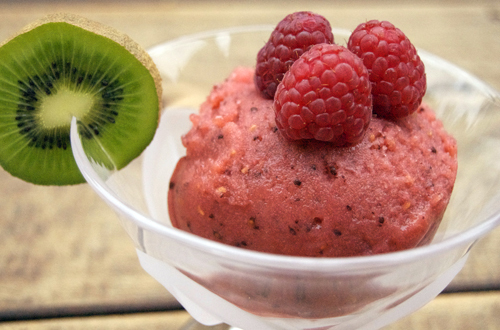 What an amazing sorbet recipe and love the addition of vodka in there. Isn’t the weather funny all over? Good to have this winner in stock, for any sudden changes! I really want to try this recipe but don’t have an ice cream maker. Anything I can do? This sorbet looks so fresh and tasty! I love the fact you see the kiwi seeds in it! Wonderful photo and great recipe for sorbet. If you are creating dishes like that I Might have to invite you to puppy sit my dogs too. Great flavor combination and very pretty picture.